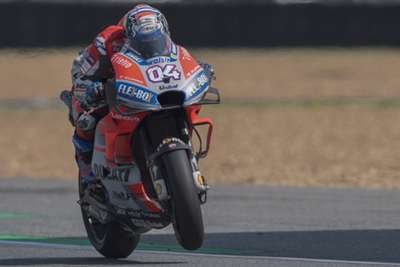 Andrea Dovizioso claimed a thrilling pole at the Japan Grand Prix as Marc Marquez could only qualify sixth fastest on Saturday. Dovizioso, last year's race winner, posted a time of one minute, 44.590 seconds to secure pole for the second time this MotoGP season. The Italian Ducati rider will start ahead of Johann Zarco, who only narrowly fell short of qualifying quickest in Japan for the second straight year. Marquez, who can secure the title on Sunday, was pushed down to sixth, while Jack Miller will surprisingly start third at Motegi. Cal Crutchlow set the early marker in Q2, becoming the first rider to break 1:45.000, before a flurry of action in the final minutes. Marquez, who crashed in FP4, was only top of the timesheets briefly before Miller and Dovizioso – who trails the Repsol Honda man by 77 points in the riders' standings – went quicker. Dovizioso's flying lap would hold at the top despite Zarco threatening, while Miller crashed in the final seconds. The pole is a huge boost to Dovizioso's chances of keeping the championship race alive beyond this weekend.